Get a closer look at our innovative Solatube products. Please click on the links below to download our brochures. Looking for answers to your daylighting questions? You’ve come to the right place. We’ve compiled this list of commonly asked questions below. If you can’t find the answer below. Don’t worry. Contact us directly. We’re easy to talk to. The Solar Electric NightLight is an integrated solar-powered nightlight that offers soft, ambient light to help homeowners navigate their home when daylight isn’t present. How does the Solatube Daylighting System Solar Electric NightLight work? The Solar Electric NightLight has an integrated solar panel that collects and generates energy from daylight coming down the Solatube system, recharging the two (2) onboard AA NiMH (Nickel Metal Hydride) rechargeable batteries. The Solar Electric NightLight has a sophisticated Dusk-to-Dawn Sensor that recognizes when there is not enough daylight (waning hours of the day). In return, the NightLight automatically turns on. This solar-powered NightLight includes two LED emitters requiring no bulb replacement over the life of the product. Solatube Daylighting Systems vary in price based on the size, the addition of extension tubes and accessories, and different roof types. Prices include product plus consultation and installation by a Certified Installation Consultant. State and federal tax credits can lower your cost. The Solatube ISn Daylighting System with Solar Electric NightLight qualifies for 30% federal tax credit on the cost of the product and installation, saving well over $100 on a single unit. Call us for details. These estimated lighting areas are based upon an average 6′ (1.82m) tube length and 8′ (2.4m) ceiling height, with the dome being in direct sunlight. Light output will vary depending on the intensity of the sun. For example, there will be more natural daylight at mid-day than in the early morning or evening. Light output may also decrease as the length of tube increases beyond the recommended distances. Are there any condensation problems with the Solatube Daylighting Systems? Condensation in buildings is mainly a winter problem, particularly where warm, moist air is generated in areas of occupancy and then penetrates to the colder parts of the building. This can result from a number of things in both residential and commercial buildings including cooking, bathing, washing dishes and/or clothes, heating, humidifying, etc. Condensation may be more acute in buildings with inadequate ventilation. In relation to Solatube Daylighting Systems, the condensation occurs when warm moist air enters into the tubing. Most likely, if there is condensation occurring in the Solatube Daylighting System, there is probably condensation around other parts of the building such as on windows, doors, and skylights. The Solatube Daylighting System is designed to be a sealed unit. All assemblies (dome, flashing, tubing, diffuser) have seals to stop bug and dirt infiltration. The maintenance-free design and shape of the dome and flashing eliminate debris build-up. Unlike traditional skylights, there is no open drywall shaft that requires cleaning and re-painting. What if the Solatube Daylighting System light is too bright or bluish? For the SolaMaster Series, we offer a secondary diffuser that fits under the dome to soften the light if necessary. There are a few factors to consider when determining if a Solatube Daylighting System will have an effect on plant growth in conjunction with the above information. The first factor would be how much UV the particular plant will need for proper growth. Second, the size of the product you are using may impact how much light the plant will be able to obtain. It is also important to point out that the Solatube Daylighting System removes a majority of the infrared wavelengths, which only provide heat to the plants. This substantially reduces any heat-related stress problems that may occur with indoor plants. Typically plant growth occurs between 400 and 1000 nanometers. Based on this data, it would be safe to say that in general, a Solatube Daylighting System will have a positive effect on plant growth depending on that particular plants UV requirements. With the infrared blocking capabilities of the Spectralight Infinity tubing, removing greater than 50% of the heat from the infrared wavelengths (>900 nanometer’s) of the sun with every reflection on the tube surface, the Solar Heat Gain of Solatube products is greatly reduced, which in turn will reduce the air conditioning load requirement for the space being daylit. These technologies allow Solatube Daylighting Systems to provide the highest light output performance with minimal thermal impact. UVA – The lowest energy range, UVA causes little burning ordinarily, but it penetrates deeply, beyond the surface layer of the skin. Over long periods of exposure, UVA causes wrinkling and premature aging of the skin. UVB – More energetic, the chief burning and tanning rays which area major factor in producing skin cancer, although not penetrating beyond the skin. UVC – The most energetic, intensely burning rays. Fortunately, UVC is mostly absorbed by the earth’s sunscreen, the ozone layer. Note: The UV information in this article is specific to Solatube Daylighting Systems – other TDD products may not provide the same performance standards. How long can the Solatube Daylighting System tube be? Your ceiling diffuser is quite easy to remove and clean. Please note that older Solatube Daylighting Systems (Installed before the year 2000) have twist-lock diffusers for the 10 in/250 mm & 14 in/350 mm. For these older units, the diffuser twists off counter-clockwise when looking up at the diffuser. If you have a unit that was installed between 2000 & 2007, to remove the diffuser simply pry down one edge of the white trim ring using something flat such as a butter knife. Continue to work your way around the ring until you have a 1/4″ (7mm) or so gap all the way around. Then simply grab onto the edges and pull straight down. The diffuser lens can be cleaned with soap and water. To reinstall the diffuser position the 4 zip style ties into the 4 holes on the ceiling ring and push up until the diffuser is flush with the ceiling. If you have a diffuser that was purchased after September 2010, you’ll need to twist off the diffuser counter-clockwise. Yes! 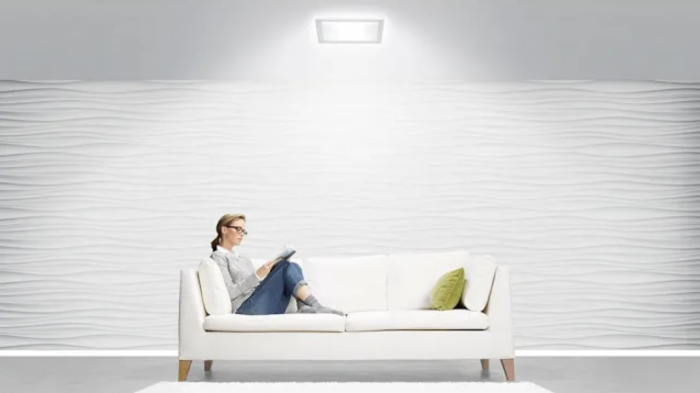 The Solatube Daylight Dimmer (Patent 7,082,726) allows the natural lighting level of a room to be turned up or down on demand, providing unprecedented flexibility for tubular skylights in both residential and commercial applications. The Daylight Dimmer easily controls the amount of light desired in any room from the convenience of a switch. Available for Solatube 160 DS, Solatube 290 DS, Solatube 330/750 DS SolaMaster Series. The patented variable butterfly baffle controls light output, making it perfect for bedrooms, family rooms, offices, classroom, and conference rooms. Yes. There are, however, a few things to be aware of in these types of applications. Because of the excess moisture in the shower, you may experience condensation, which is not covered under the warranty as it is a natural occurrence. You will want to make sure there is proper ventilation and it would be recommended to utilize the Natural Effect Lens for Climate Control to minimize the air exchange between the shower and inside of the tubing as much as possible. How short can the Solatube Daylighting System tube be? Yes, if there is a closet or place for the tubes to run from the roof through the house to the first floor or to the basement. A Solatube 290 DS is recommended due to the long distance from the roof. Usually, a chase is built around the tubing for added protection. What does the Solatube Daylighting System ceiling fixture (diffuser) look like? OptiView® Diffuser: Allows a view of the sky through a series of high-tech radial lenses. This high-tech lens is highly effective at diffusing light and minimizing glare. The OptiView diffuser not only looks great but also adds some additional features to the Solatube skylights that no other product can match. This revolutionary diffuser lens bends the light exiting our Spectralight® Infinity optical tubing upward approximately 85 degrees which provides much better light dispersion. The other wonderful feature is that when you look up through the lens you see miniature views of the sun, moon, and sky. Can I split the Solatube Daylighting System tubing and light two rooms from only one dome? What happens if the Solatube Daylighting System dome gets covered with snow? The dome is made from high-quality acrylic resin that is specifically formulated for increased impact strength, chemical, weather resistance, and high clarity. For High-Velocity Hurricane Zone areas, we have available the Shock Inner Dome for the Brighten Up® Series. For the SolaMaster® Series, we offer a Polycarbonate inner dome. The Solatube Daylighting System, for example, features several patented enhancement devices, which work in concert to capture more light from all angles and reflect it down the tube for higher light output during the early morning, late afternoon and in the winter months when the sun is low on the horizon. Yes, with the optional flat “no-pitch” flashing the Solatube Daylighting System can be installed on low pitched roofs ranging from flat (0/12 pitch) to 3/12 pitches. The flat “no-pitch”flashings are available in 4″ (100mm) and 6″ (150mm) heights for residential applications. The 750 DS and 330 DS SolaMaster series for commercial applications have 4″, 8” and 11″self-flashing options available for flat or low pitched roofs. Another option is to use the curb cap option (curb by others). Dimensions of the curb cap can be located under the Technical Resources section of the Solatube website – simply open a CAD drawing of a SolaMaster daylighting system which is using the cap option. How much air can the Solatube Daylighting System's Ventilation Add-on Kit move? The Solatube Daylighting System’s proprietary fan/motor is rated at 110-CFM (cubic feet per minute; 3 Cubic Meters per minute) which is of much higher performance than a standard bathroom vent that most of us have in our homes. This ensures quick and effective ventilation. What if there is moisture accumulating on the outside of the Solatube Daylighting System tube?